After establishing an environmental management system under our Environmental Policy, we obtained ISO 14001 certification* in July 1998. Since then we have implemented measures for waste reduction and reduced resource and energy consumption. 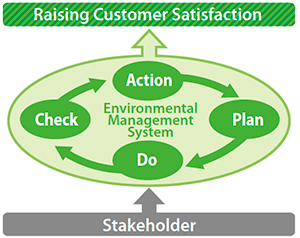 We have also taken a step farther in light of a number of factors, including society’s movement toward environmentally sound products and growing public interest in eco products, by operating our environmental management system, which emphasizes environmental targets centered on environmentally sound products. * EIZO MS Corporation, EIZO GmbH, EIZO Technologies GmbH, and EIZO Display Technologies (Suzhou) Co., Ltd. have also obtained certification. We continued to undertake many tasks for meeting our environmental targets for fiscal 2014 that would achieve results in product specifications. We also sought to accomplish these tasks and targets by sharing them with in-house organizations, including the design and development departments. We successfully reduced power consumption during suspension and use, exercised stricter control over chemical substances used in parts, and manufactured products that meet advanced environmental standards. Our ISO 14001 certification was maintained and updated in fiscal 2014 after a third-party institution conducted an external audit. Ordering and questions 1 (800) 800-5202 or contact us. Copyright © 1996-2019 EIZO Inc. All Rights Reserved.